If you’re looking for information on how to cook a pork loin, you’ve come to the right place. A smoked pork loin is one of the easiest things you can cook on a smoker. Remove the silverskin, and throw it in the smoker for 3 hours at 225, and call it good. That’s it! 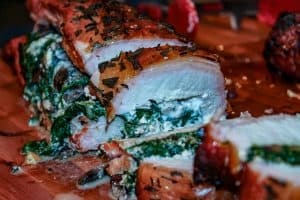 There are a lot of different ways you can build on that technique and one of my favorites is a spinach, mushroom, and goat cheese stuffed pork loin. Making a stuffed pork loin is a simple process, as long as you follow the directions. There is a little bit of prep work involved hours before you cook, so plan accordingly. One thing to note, make sure you get a pork loin for this recipe. A pork tenderloin is a different cut of meat. There are a lot of different ingredients you can stuff a pork loin with. In fact, the possibilities are endless. You could stuff the pork loin with asparagus, walnuts and, craisins or maybe you want to keep it simple and stuff the pork loin with some sliced apples? I like simple, but that’s not what I’m going for today. If you’re new to all of this, you might be wondering, how do I stuff a pork loin? Well, I’m glad you asked! Let’s get started. Before we stuff the pork loin, we need to prep our fillings. In a cast iron skillet add 2 tablespoons of butter and half a pound of sliced mushrooms. You’ll want to cook the mushrooms over medium heat for ten to fifteen minutes. The mushrooms should turn from a bright white to light brown color. Once the mushrooms have cooked, add 8 ounces of spinach to the cast iron skillet. After another five minutes or so the spinach should be cooked down, and it’s time to remove the cast iron skillet from heat. Put the spinach and mushroom mixture into an airtight container in the refrigerator until it’s time to stuff the pork loin. Smoking Bacon is an easy process. We are not doing anything fancy to the bacon this time, just getting it cooked enough to dice, and add to our filling. Cook a pound of bacon at 225 degrees for about 90 minutes on your Traeger. After 90 minutes, remove the bacon from the smoker, let it cool, and then dice it up and add the bacon to your spinach and mushrooms. To stuff a pork loin you have to make it stuffable first. That involves cutting a pork loin lengthwise, almost all the way through. You want about a half inch of meat at the seam. Once you’ve cut the pork loin, lay it seam side down on a piece of wax paper, and then put another piece of wax paper on top of it. You’re going to flatten out the pork loin using a meat tenderizer. Pound out the meat until it’s an even thickness throughout. After you’ve pounded out the meat, it’s time to add your stuffing. I gotta warn you, this step could get messy. In addition to the spinach/bacon/mushroom combo, we’re going to be adding a tablespoon of salt, a teaspoon of pepper, and about 6 ounces of goat cheese crumbles. Parallel to one long edge of the pork loin, add all of your ingredients in a line. Sprinkle the salt and pepper over all of the filling and meat. Now it’s time to roll! Using the wax paper that’s below the pork loin as an assist, slowly roll the pork loin on top of itself, starting with the edge that has all of the fillings. Make the roll as tight as possible. Use 3 or 4 pieces of butchers twine to tie the roll tight. After tieing off the pork loin I rolled it in diced rosemary, thyme, and sage. Now that you’ve prepped your stuffed pork loin, the only thing left is to smoke it. Get your smoker setup to smoke at around 150 degrees, and place your stuffed pork loin in the smoker for one hour. After an hour remove the pork loin from the smoker, and turn the heat up to 350. Spray the pork loin with a mixture of one half cup apple juice, and a tablespoon of honey, and then put the pork loin back in the smoker for another 45 minutes or so. The Stuffed pork loin is ready when the internal temperature is 155 degrees. Guesstimating whether or not your meats have been cooked to the right internal temp is not safe, especially when you are working with pork. I use a Thermapen to check internal temps, and I love it! Click here to get one for your home. When the pork loin is cooked, pull it from the smoker and tent it with foil for about 15 minutes to allow the meat to rest, and then slice thin and serve. Stuffed pork loin is a meal in itself. I’d serve this with a good wedge salad, or maybe some brussel sprouts and bacon? Thanks for reading. I always love hearing from people like you. Have you made a smoked pork loin before? What would you do differently? Let me know in the comments. Making a stuffed pork loin is a simple process that produces mouth-watering results, as long as you follow the directions. There is a little bit of prep work involved hours before you cook, so plan accordingly. In a cast iron skillet add 2 tablespoons of butter and half a pound of sliced mushrooms. You'll want to cook the mushrooms over medium heat for ten to fifteen minutes. The mushrooms should turn from a bright white to light brown color. Once the mushrooms have cooked, add 8 ounces of spinach to the cast iron skillet. After another five minutes or so the spinach should be cooked down, and it's time to remove the cast iron skillet from heat. 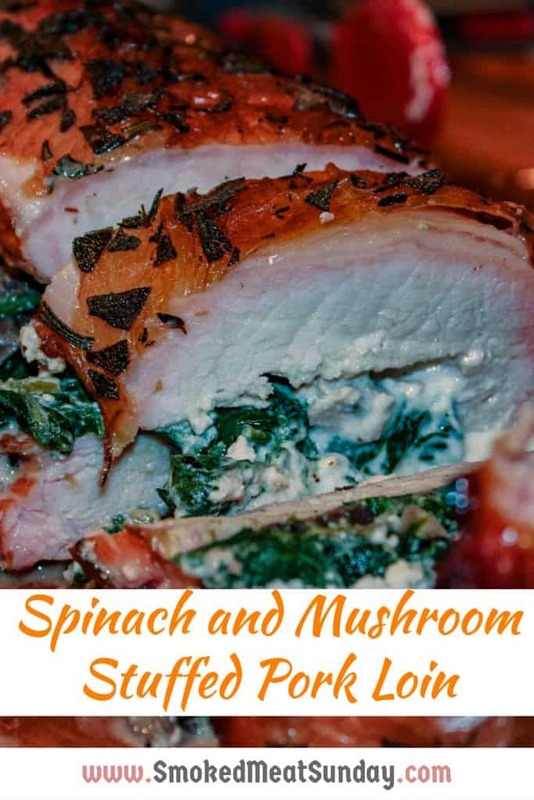 Put the spinach and mushroom mixture into an airtight container in the refrigerator until it's time to stuff the pork loin. 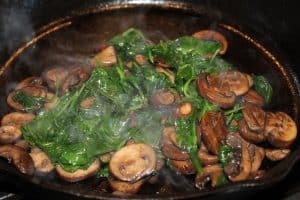 Once the mushrooms have cooked, add 8 ounces of spinach to the cast iron skillet. After another five minutes or so the spinach should be cooked down, and it's time to remove the cast iron skillet from heat. 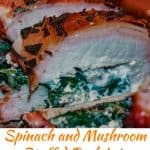 Put the spinach and mushroom mixture into an airtight container in the refrigerator until it's time to stuff the pork loin. Cook a half pound of bacon at 225 degrees for about 90 minutes on your Traeger. After 90 minutes, remove the bacon from the smoker, let it cool, and then dice it up and add the bacon to your spinach and mushrooms. You're going to flatten out the pork loin using a meat tenderizer. Pound out the meat on wax paper until it's an even thickness throughout. Parallel to one long edge of the pork loin, add all of your ingredients in a line. Sprinkle the salt and pepper over all of the filling and meat. Using the wax paper that's below the pork loin as an assist, slowly roll the pork loin on top of itself, starting with the edge that has all of the fillings. Make the roll as tight as possible. Use 3 or 4 pieces of butchers twine to tie the roll tight. Get your smoker setup to smoke at around 150 degrees, and place your stuffed pork loin in the smoker for one hour. After an hour remove the pork loin from the smoker, and turn the heat up to 350. Spray the pork loin with a mixture of one half cup apple juice, and a tablespoon of honey, and then put the pork loin back in the smoker for another 45 minutes or so. The Stuffed pork loin is ready when the internal temperature is 155 degrees. Pull the stuffed pork loin from the smoker and tent it with foil for about 15 minutes to allow the meat to rest. Slice thin and serve. This recipe is definitely one of my favorites! Every home should have a BBQ department!